To purchase the song click here. Has society made any progress? The Red Tent Movie, Things We Don’t Talk About, continued to expand its worldwide reach in May 2014, premiering in Catalonia, Spain, at a well-attended screening on the 7th. Enthusiasm for the Red Tent movement subsequently spread across the region, sparking additional screenings and new Red Tents. Meanwhile, in the US, women’s Red Tent stories, many growing directly out of the movie, deepened and were shared. 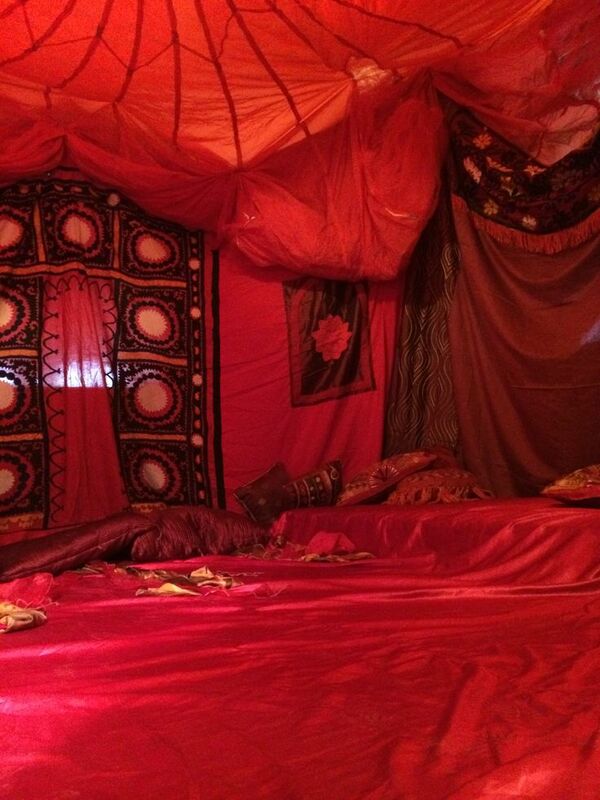 Red Tent & movie screening from the RCG-I Priestess Gathering this past weekend. Wisconsin Dells, WI. Dr. Isadora also attended two screenings during May. The first, on the 17th, took place during the annual RCGI (Re-formed Congregation of the Goddess, International) Priestess Gathering in Wisconsin Dells, WI, a three-day festival that is this organization’s largest regular event. The RCGI, founded and run by Lynnie Levy and Jade River, is an endorser of the film; one of its local chapters (in Indianapolis) hosted a screening last August. A Red Tent was raised for the duration of the gathering: mattresses on the floor of a small circular room provided a cozy place for women to rest, converse, and drink in the beauty of the space (uniquely situated inside a turret of a building called “The Castle”!). Dr. Isadora noted that out of the approximately 100 women who attended the festival, almost all reported having spent some time in the Red Tent; they were so moved by the experience that another Red Tent was requested for next year’s festival! The Saturday morning Red Tent Movie screening was followed by a group discussion that explored the larger role and impact of the Red Tent movement. A woman asked whether women in society are being forced to constantly “reinvent the wheel,” given that there have been various forms of women’s movements over the years and yet women’s freedom and empowerment are still being sought. How is the Red Tent movement different from, for example, consciousness raising groups? Has society made any progress? In answer, Dr. Isadora offered the idea that the needs of women change in each generation; the needs women had 50 years ago are not quite the same as the needs women have today. The Red Tent movement grew out of the needs of women today. It serves today’s communities by providing women a place to “just be” without any expectations, a place of refuge from the demands of increasingly busy lifestyles. Also, as pointed out by another participant, an elder herself, older women are respected in Red Tent space in ways they are often not in the rest of society. Women elders often become invisible because they are not participating in “busy” culture in the same way younger women are. Just like the grandmother in the film who attended her first Red Tent and found she was very much needed and wanted there, women elders are finding that the Red Tent movement is restoring them to their ancient role of teachers and wisdom keepers for younger generations. It’s worth noting that the fact that these kinds of rich insights were able to emerge and flourish probably had a lot to do with the discussion itself taking place in a Red Tent context—a further endorsement of the movement’s active, essential role in supporting women. The next screening Dr. Isadora attended was on May 31st, at A Center for Healing and Wellness in Bloomington, Illinois. The host, Tonya Keach, is a practitioner at this center, which specializes in healing modalities including yoga, massage, and reiki. Approximately 45 women attended the screening, filling the small space. Tonya, as the leader of a monthly women’s circle, truly appreciates women’s community. She resonated with the movie for this reason. Although her circle is not officially a Red Tent, she said that she might introduce some red fabric just for fun! She built the film screening itself around the idea of supporting local woman-owned businesses: the following Red Tent was catered by a local woman, while other area women’s businesses donated door prizes. Attendees loved the entire experience. The veil dancing ritual, which Dr. Isadora began introducing to all of her Red Tents almost six months ago, was one of the largest. The small space required women to dance very close to each other, resulting in a deeply communal experience. “Waves of laughter” kept moving through the group, as well as tears that came from seeing the honoring of women. Participants said they had never before experienced anything like it. Women’s stories are constantly evolving as new experiences are encountered and new challenges are met. Through it all, the Red Tent is a steady anchoring presence, a touchstone, a mirror. As it has been for the women moved and changed in some way by the film, so may it be for us all.